The Jungle Oasis Permaculture Project is a non-profit initiative that is part of the Jungle Pool Trust. The trust is an Indian registered charity and it is run by volunteers. 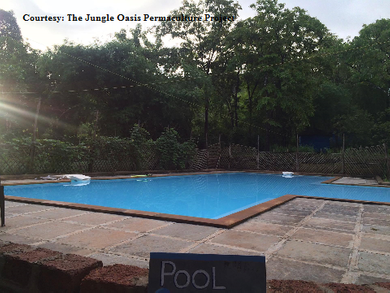 The Jungle Pool Trust has swimming classes for children in the area as well as for special needs children. The charity is not government funded and hence is sustained by the courses run by the Jungle Oasis Permaculture Project, which is by itself self-sustaining. The trust also has a restaurant and dance theatre which provide funds. The Jungle Oasis Permaculture Project has a 5 acre land area encompassing a restaurant, classroom, pool, lawn and accommodation for 18 people. The Project was developed by Joey Devlin, who has added permaculture to his career repertoire. He talks about introducing the philosophy of design in healthcare and is in the process of pursuing a course in permaculture in Australia. ‘I really want to learn how to design healing spaces. I want to take what I’ve learnt from my career, that is, people care. You know the three principles of permaculture: people care, Earth care and fair share. I want to enhance my ability to care for people by designing spaces that heal people and also spaces that regenerate the Earth, places that step lightly on the Earth. These regenerative experiences which heal people will in turn allow them to make sensible decisions around the ecology…around the choices of how they work, what they do or don’t do for the environment and how they can support each other,’ he says. Following the principles of permaculture, which was first introduced by Bill Mollison, who is recently deceased, and David Holmgren, the project concentrates on replenishing the soil in its ability to nurture an abundance of endemic and foreign foliage. It aims to create ethical livelihoods and is open to people of all economic and social circumstances, and is accessible to persons of varying physical abilities. The project has been established to develop an environment that is self-sustaining and healing in its relationship with humans. 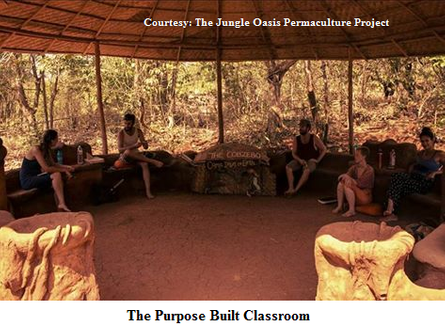 The course, run by the Jungle Oasis Permaculture Project, provides supportive hands-on training and helps students commune with nature while imbuing its therapeutic attributes. It is an internationally recognised course that will be run over eighteen days from 2nd to 19th November at Arambol, Goa. It is called the 72 Hour Permaculture Design Course. There will be residential students as well as those coming from outside. Students will be able to construct designs for project sites and discuss future projects. The course will comprise of lectures, guest presentations, slide shows, movies, group discussions, games, etc. The principles of permaculture will be understood in the cultural, social, economic and political context, and how they can be applied in those areas. The culmination of this workshop will be the involvement of the students in a project in the vicinity, which will extend their first-hand experience of permaculture design. The theory and practical knowledge gained in this course will equip students as certified permaculture practitioners (at the basic level). Some of the subjects that will be dealt with are: the Ethics and principles of permaculture, Energy storage and resources, Micro‐Organisms and their uses, Integrated pest management, etc. Hands-on projects may involve greywater system construction, solar hot water construction, harvesting indigenous micro‐organisms (IMOs) and so on. The design assignments given to students at the end of the course will be presented to the class and other interested people, locals included. These designs will remain with the Jungle Oasis Permaculture Project. 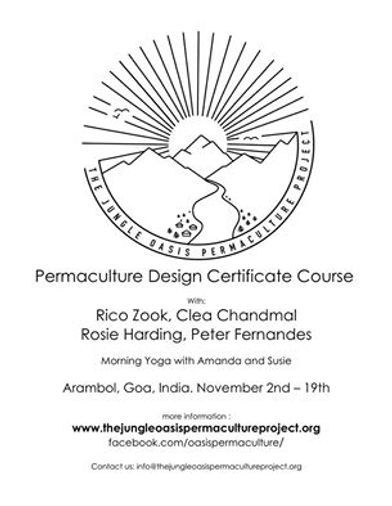 Rico Zook is one of the Permaculture Design Course teachers and teaches the advanced course too. He has been a permaculture designer for 8 years and has worked in Mexico, Cambodia, India, Spain and other places, helping native people preserve their traditional technologies and wisdom while assisting them adapt to globalisation. Clea Chandmal, another teacher, has developed her own farm in Goa called Foyts Farm as a model permaculture site. She also acts as a consultant and teaches permaculture to farmers and landowners in Goa with the distinct objective of addressing the problems of farmer suicides and malnutrition. Rosie Harding and Peter Fernandes make up the other teachers for the course. They discovered the benefits of permaculture by transforming the barren land attached to their home into a thriving productive green zone. They are concerned with farmer, market gardener and kitchen gardener support, and the creation of local market hubs among other projects. The course costs Rs 50,000 with food and accommodation (two persons per tipi or hut), but varies depending on the need for nourishment and shelter. The Project allows for a reduced fee for those who are unable to afford the course. Efforts are on to crowdfund five places that will be made available to local people. To enrol for the course you need to download a form at regformpdcjdnov16 , fill it up and email it to info@jungleoasispermaculture.org.